Our developers have whipped up the ability to hide spoilers in Talk posts! Check out the blog for details, and let us know here if you have any questions or comments! I had really wanted this feature for a long time...so many, many thanks, lorannnen and Tim! And be sure to not reveal anything until at least the opening of discussions for OLOB! One thing to note as we uncovered in another thread. For whatever reason, my account in one browser was stuck never loading any of the new spoiler code. So spoilers didn't do anything there. Once I logged out and back in, it was fine. If anyone else reports not seeing them properly they might need to do the same. Will the spoilers tag also work in reviews and comments and private comments ? I could test for myself but figure that the answer will be helpful for others as well. >5 Keeline: Good question! Spoilers do work in reviews, as well as comments, and private comments! Oh, darn. I don't suppose there's any chance of an option to always see spoilers in reviews? I saw the first post and thought "Nice, and thankfully they were sensible and restricted the functionality to Talk". Oh well. Men spoilervarningar fungerar även på lokaliserade språk? Även om texten innehåller tecken utanför den ordinarie ASCII-tabellen Och hur blir det med proberstenar, om man vill varna för att läsa At Swim-Two-birds? When will we be able to translate the string "Spoiler (click to see)"? > 9 : I second you. #7 by lorax> I, on the other hand, would find them much more pointless if they were restricted to talk rather than reviews. If I had to pick one place to use them, it'd be reviews. Hard to please everyone and you know Tim hates options. On devices that allow it, you can set up a CSS override. IIRC when I looked into it, it's all done with CSS trickery. Yeah, okay, I hate being on ancient technology, cause nobody tests it any more. Even with a log out/log back in - NOT working. Interesting, a touchstone becomes visible on mouseover. Well, not a problem. I don't suppose there's any chance of an option to always see spoilers in reviews? The option works well for reviews -- I've encountered a few with just a little too much information (I'd already read the book, wasn't looking for a recommendation). They also should work in comments, in case users want that functionality there. >9 anglemark:,10 Just to get an idea, what sort of translations do you foresee for the term "spoiler"? Nothing comes to mind for me in Italian, besides an actual explanation of what a spoiler does after "notizia". >17 matthewmason: : In French, I'd say "Dévoilement de l'intrigue". In modern Swedish Internet parlance, everyone says "spolier". But I want to translate "click to see". For other languages I have no idea, but my guess is that the English term is pretty widely spread. >18 Louve_de_mer:: That's the kind of way we used to express it before "spoiler" took over. > 17, 19 : Anglemark is right, "click to see" is more important to translate than "spoiler". Can it be made clear that using this is a courtesy, but purely at the discretion of the poster, and that criticizing someone for choosing not to use it is not appropriate? Otherwise I'm worried that there will be endless discussions of what exactly constitutes a spoiler - is it just major plot twists (Darth Vader is Luke's father), is it anything that happens more than halfway through the book, is it anything at all that happens in the plot? I've seen all these points of view expressed. >19 anglemark: "Click to see" is important. >24 matthewmason: : That's why we need to translate it. ^23 Darth Vader is Luke's father?! In seriousness, I do agree that people cannot expect everyone to use this just because it's available. Personally, I don't read reviews of books until after I've read the book, to avoid spoilers. I try to mark spoilers in my own reviews just in case. I like that we'll have this shortcut, but I will still just avoid threads or reviews if I'm worried. >27 lorax: Right. At least GIFs are not in reviews at the moment. How ubiquitous is the 'Spoiler Police' right now? Varför skulle man vilja göra det? At least GIFs are not in reviews at the moment. At the moment? Please, please tell me that doesn't mean they're being seriously considered, especially in light of Tim's rather vehement opposition. How ubiquitous is the 'Spoiler Police' right now? Well, this feature is brand-new; give them some time. Mostly I think it can be completely avoided if there's clear communication as I suggested in #23 that the use of this feature is optional. I'm certainly against it indefinitely. When it comes to your own test (including reviews), this should be the case. You're review is your review— if you want to include them, you can. Many might not want to, for continuities sake, especially when importing and exporting. It was mostly designed for Talk (and OLOB) as a solution to outright banning spoilers altogether, and accordingly gagging folks— manners and total freedom meeting halfway. In light of the fact that there is strenuous disagreement as to what constitutes a spoiler, that would be tantamount to closing the forums and eliminating reviews altogether. Use of the "spoiler" feature in Talk posts will be optional. People cannot be flagged or chastised for choosing not to use it or forgetting to use it when discussing a book in Talk. OLOB can have special rules, I suppose. That's a special case and not my primary concern. >34 lilithcat: : One LibraryThing, One Book. One LibraryThing, One Book, that new "book club". If they want to mandate use of the spoiler flag there, that's fine. I'll probably choose not to participate if that's the case, I'd rather they just say "Please don't talk about the book before Date X", but one group having different rules is fine. A sweeping rules change across all of Talk would be really worrisome, though, especially with zero discussion beforehand. >33 lorax: Not the rest of talk. For One LibraryThing One Book, we didn't have any meteoric problems with spoilers last time before discussion opened. I don't think we will ever allow hard-and-fast spoiler flags—it should start with kindly asking the person to edit the post with the tags, as lorax suggests, if its really egregious, right? The problem is that there is no agreement on what a spoiler is and isn't. We have had extensive discussions on this subject, which I can dig up, but you can probably dig up faster. They got nowhere. If you make it a rule that people must hide spoilers, I think you will rapidly find yourself in the middle of a discussion, not of the book, but of whether or not certain posts contain spoilers. I don't object to the code. I don't object to people using it if they want to. I don't object to certain areas being labeled spoiler free (though like lorax I'm unlikely to participate), but if people who are spoiler adverse are going to be able to "request" spoiler flags all over the site, it's going to be unpleasant. it should start with kindly asking the person to edit the post with the tags, as lorax suggests, if its really egregious, right? Wrong. I have a problem with this whole idea to begin with (because I think people will be attacked for not using the tags) , and, frankly, the minute someone tried to tell me how to write my posts, assuming I weren't abusive or violating the TOS, that person would be told where to go and then blocked. Once again, who defines "egregious"? I have seen people bent out of shape because of references to historical events. And see post #26 in this thread. I know amysisson was joking, but the fact is that there are people who would consider that a spoiler. I wasn't suggesting anything, really, though I am quite relieved to see that any demands for this will be restricted to One Librarything, One Book, which I can easily avoid it they become too intrusive. As aulsmith says, and as I said back in #23, there is no agreement as to what constitutes a spoiler - there are people who will say in all seriousness that saying that Romeo and Juliet die at the end is a spoiler, for something revealed in the opening lines of a four-hundred-year-old play, or that mentioning that the Titanic sinks, a well-known historical event, is a spoiler for the movie. If you want to set rules for when plot events can be discussed in One LibraryThing, One Book, then do that. If you want to give people optional tools to use purely at their discretion to use elsewhere to conceal spoilers, then do that. Don't upend the entire structure of LT to do it, and don't create situations where people will pressure or "ask" others to rewrite posts that do not violate the TOS. Wow, nobody has done anything at all and you guys are already on a crusade against ...goodness only knows what. Geez. Maybe you ought to wait to condemn it/the people who use it until, you know, anybody actually attempts any of this junk? There are already spoiler police who will flag reviews as not a review if they reveal too much of the plot, etc. So I can see this getting ugly fast if they ramp up to messages regarding spoilerific comments. Well that's an abuse of flags, and it'd continue to be abuse of flags in Talk, where it would be more visible that they were abusing them, so no, I don't see it getting out of hand. So a spoiler is ambiguous semantically. Scratch telling people when they should or shouldn't use spoilers -- it's up to you. I made the suggestion for a very specific circumstance, pre-OLOB, under the impression that users are going to end up suggesting to others what might be spoilers or not. Of course there's a massive gray area that people will discuss to no end, but there is nothing ambiguous about, for example, the ending of Dorian. Banning people on the account of a spoiler (or telling other people they can't post something because it is one) is totally out of the question. That's unreasonable. If controversy happens, hopefully this will cushion it. >40 lorax: The tag is there so people won't have to rewrite posts. It's simply a degree of precaution for those who are further ahead than others. Anything can be a spoiler, but that should stop people from discussing what one is (and using the tag if they want to). I don't want to be smarmy, but we do read at different paces, and we all want to talk as we read, too. This should help. GIFs are not going to happen. I could see another place to add them, but not in normal reviews. I share your caution at this. Chris presented this as something he'd done on his own. (That is, I didn't task him with this.) I think it has a limited field of use, and I'm interested to see what happens to it. Yeah, that's my worry about this—that people start expecting a lack of spoilers. If that doesn't work out that way, we'll take it away. The use of the spoiler tag is completely optional and at the discretion of the poster. Just as it's been completely optional to just say "Spoilers follow:" in your post. Nobody should be drawn and quartered for not using the tag. But that doesn't mean that people won't kindly ask you to edit your post and include it so as to be courteous to the others in the discussion. Honestly, there are times you don't even realize that you're giving away a spoiler. Conversely, those reading a post that might need a spoiler should be especially courteous to the original author of the post/review. That person might not be as savvy with posting, might not know about the spoiler tag, might not realize that she has a spoiler in her text, etc., etc. In the end, concerning both sides, just treat others in the discussion the same way you'd treat somebody discussing the book with you over a lunch table. Just be courteous, you'll be amazed at the results. I hope policy isn't going to be determined by extreme paranoia, on either side. And at this point, I'd say the people opposed to extreme spoiler policing are themselves the ones taking things to extremes. Really, asking that people make an effort to avoid spoiling things for others would be equivalent to shutting down Talk entirely? I regularly read threads full of book reviews, and I've seen pretty much zero debate about what constitutes a spoiler. People tend to include a warning out of courtesy to others, and others don't tend to dispute their assessment. In practice, it's really not that hard. Just be courteous, you'll be amazed at the results. #29 by andejons> Man kanske är allergisk mot god litteratur? >47 _Zoe_: Indeed. Agreed on all counts. #45 by timspalding> Use of the "spoiler" feature in Talk posts will be optional. People cannot be flagged or chastised for choosing not to use it or forgetting to use it when discussing a book in Talk. This is foolishness, in my opinion. Before this spoiler tag, people were already (generally, by common courtesy) expected to put some sort of spoiler warning on something that seemed spoilerish in the appropriate context. Example: In the monthly reading thread on the SF group, if someone said they read So-and-so's new book but they were disappointed that the protagonist died at the end without putting ANY sort of spoiler warning, they would have been chastised. And rightly so. Try doing the same thing in person and you'll also be chastised. And rightly so. So don't expect having a feature to mark a spoiler warning as really changing that paradigm of common courtesy. There's a time and a place for everything and one of the complexities of social interaction is navigating this. As for the flagging question - for crying out loud do we always have to invent problems here before they actually happen? This really seems like a prime example of such a thing. This is foolishness, in my opinion. Yes, but "we'll take it away" is unfortunately pretty well-established as the default LT response to a few people shouting loudly about a new feature. Also, it's worth noting that this feature has been out for months and the sky hasn't collapsed yet. Yup. It's been used (and lightly discussed) in a number of threads, including some in the "standing groups," so I don't know why it's suddenly so earth-shattering a development. Well, because it wasn't generally known. Just curious, how did people know it was available? I don't care, just curious if it was just a happy accident of somebody trying it once. It has been available since the original The Circle OLOB discussions (I added it after those started to specifically address some of the spoilers in those threads). BTW I don't see it in that topic, but I do in the blog post. I think this is the first I heard of it. Also, I have an update to the feature that will allow translations to the spoiler alert. That will be available later tonight after some testing. I was wondering how you did that! That's an amazing new feature. It merits a message on the "how to do cool stuff in your threads" thread. The new spoiler feature seems like a good one and I hope it stays. Haven't used it yet, but I am sure I will. It's a very good idea. I was also amazed by your spoiler text and glad you shared the secret. Let's hope it sticks, as it is super useful. >56 conceptDawg: I couldn't say specifically, I just know I've seen it around for a little bit now, mentioned in various threads. I've certainly never seen it. This thread was the first I knew about it. I've been noticing it in reviews in the last few weeks. I think it is nice to have. I feel that I can include more information in my reviews and conversations without giving too much away. 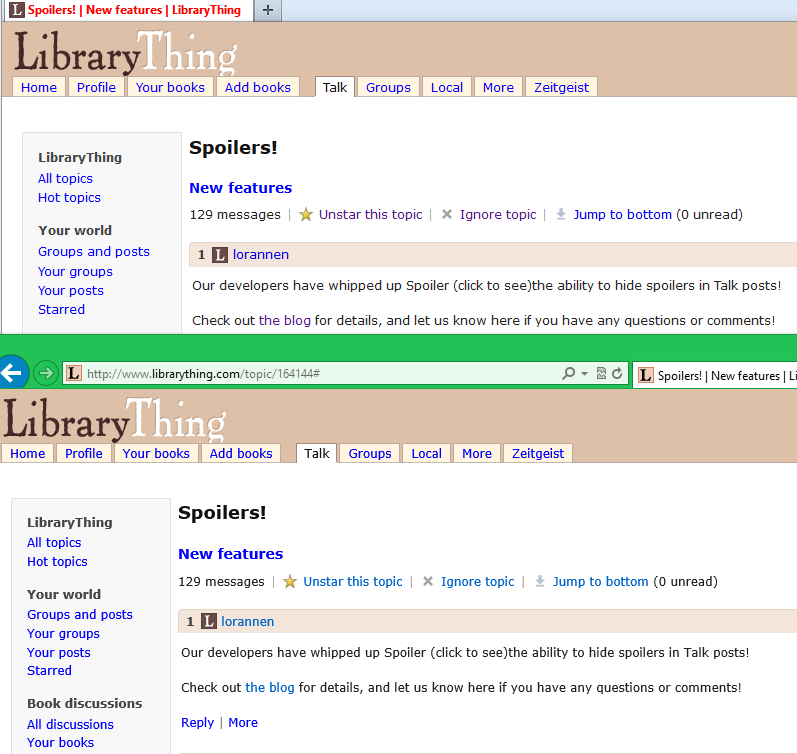 Yeah, the spoiler tag is NOT working on my browser. Now I have no indication whatsoever that a spoiler is coming up. At least without the feature people generally gave a spoiler warning beforehand. Plus people are more likely to post spoilers now, since they think no one can see it. This is potentially disastrous for me. I'm using IE 11.0.9600.16428 on Windows 7. FYI, works for me in IE10 on Win8. I think this is a great idea. It certainly doesn't make the spoiler problem worse and it give another option besides yelling spoiler alert in the middle of the text. I will definitely use it in reviews to discuss aspects of books that I have strong feelings about and personally want to remember, but usually do not include because it might ruin the book for someone else. That way the review can be for me as much as for anyone else. Sure isn't working for me. Do others see the spoiler message there? I see This is a test. The two tags disappear. I'd say this is a really bad idea unless it works for everyone. Yeah it works fine, MJ. What browser+OS are you using? Safari on my iPad iOS7. Both are up to date. I'm at least glad to know that I did it right. Looks as if the parser is matching "spoiler" instead of "/spoiler" when looking for the closing tag. As long as the Tags are opened and closed for each event they work correctly. But, I see you do have a point. I'm not all that keen on the term 'spoiler' personally; it does not translate well into other languages; but that battle is already lost I guess. However, I do like this feature. Thanks for publicising it. There is certainly an art to posting a well written review that does not give away too many plot details; but sometimes it is almost unavoidable! On the occasions where I have needed to reveal parts of the story, I have always given a written spoiler alert. I personally do like this way of using hidden text however. And have adjusted some of my earlier reviews to make use of the feature. lorannen: just treat others in the discussion the same way you'd treat somebody discussing the book with you over a lunch table. I put my fingers in my ears and go LALALALALALALALA if I detect a hint of spoilage, how can I do that online? LOL. I glare. And if that doesn't work I resort to STOP TALKING, DAMMIT! spoilering an url doesn't quite work as it should. Hm. Let me check: Stop telling me how to live! You are correct. I need to override a css class there. Will do. Though to be fair, because of the light-weight way in which I'm doing the spoilers you'll always be able to click a link hidden spoiler. It's not gone, just hidden. We could do it a myriad different ways but this was the path of least resistance that works for 98% of the instances. Fixed that...at least it's hidden when you mouse-over it now. The same caveat about it just being hidden still holds true. Also, the text is translatable now but I need to check with Tim about how we can/should make it show up in the listing. Spoiler (Click to see) This is a test. At least I would know that someone had tried to hide something. #81 by MarthaJeanne> I can't see what you refer to. FF 26.0, Win 7. MarthaJeanne, I'll do some more testing on the iPad to see why it's not following the rules here. It has worked perfectly for me from the start on iPad with the current iOS 7, using Safari or Mercury browsers. I saw Tim using it in a test group a while back. I've since seen a few usages "in the wild", as it were; I don't know where the users picked it up. I do think it's a neat feature. I'm glad that the fact that it's optional has been made crystal-clear, too. I'm not on an iPad and it's never worked for me. Firefox 26.0, Windows 7. What extensions do you use? Just the usual - Flash, that type of thing. No ad blockers or anything like that. And nothing that changes any styling like Stylish or Greasemonkey? Because it certain works in any of the latest versions of Firefox, Chrome, Safari, and even IE. And by latest, I mean browsers in the last 5 years or so. It's not exactly doing any heavy lifting. When you say it's "not working" what do you mean? Is it not hiding the spoiler text or is it hiding it and you can't click to see it? Or some crazy combination? With no marking or indication of spoilers, or hiding of the spoiler text itself. #91 by conceptDawg> I really gotta wonder if some these people are getting "stuck" with old css files for some reason. Is there anything you can do to test/verify that? Does Ctrl+F5 work to unstuck old CSS? I tried that, and tried deleting the cache (and cookies even) but I'm still seeing the same thing. Snap. Just seeing nothing at all, only the original unspoilered text, without even a hint that it was inteded to be conceal. I've found that with IE to *really* purge the code cache you have to go to the gear icon in the upper right choose Safety and Delete Browsing History, check the Temporary Internet Files box and OK it. I have nothing that changes styles. I don't even know that there are spoilers. They aren't marked in any fashion. The only reason I know there was supposed to be a spoiler warning is because someone else mentions how cool it was in post so and so. I just see what was typed. Except once in this thread, I saw: Spoiler (click to see) Stop telling me how to live! and the part after click to see was a link to a comic. ETA: Now I'm getting Spoiler (click to see) and then the text. Just saw it in another thread. #98 by Morphidae> Can you try another browser on that machine? Would help determine if it's your account that is getting stuck on the wrong CSS or if it's specific to your browser. Other question is whether you've change any of the fonts or colors in your browser settings at all. I know these may sound like dumb questions but you have to eliminate stuff. ... and it obviously had to be a Whovian! Okay, so still not working for me. IE 8, Win XP Pro. Java working. I'm seeing the text that is supposed to be hidden. Found the same problem at home using IE 8 Win XP home. IE8 and not handling the css correctly? Could the page be displaying in Quirks mode? I'm not sure if :before works correctly in that case. >99 brightcopy: Okay, it's working in Chrome. Nice catch. No font or color changes in Firefox. I'm not that browser savvy. I'm a basic "If a website need something to work, I'll download it" person. Otherwise, I don't mess with it. Ugh, tried to find a way to copy/paste my add-on list, but there isn't one. I'll have to type it. There's also a Pinit button for Pintrest and a spellchecker. There's nothing in appearance except the default. Morphy, Silverlight is Microsoft's proprietary Flash alternative thing. #103 by andyl> Could the page be displaying in Quirks mode? I'm not sure if :before works correctly in that case. For those in IE, look for an icon in or near the URL for what looks like a piece of paper with a rip across the middle. This symbolizes what IE is doing to the website. Click that icon to toggle it on/off. You want it toggled to the mode that makes the spoilers look right. Of course, that does nothing for the problems of those on FF26 (Morphidae and anyone else?) I do not believe FF has anything similar to this. #104 by Morphidae> Yeah, nothing there looks in any way related. Thanks for going to the trouble. I'm sure if you're affected there have to be at least some nonzero of other, silent people who are also. I've got nothing right now. Will keep thinking. It works fine on both my computers, ancient Fx on ancient Ubuntu (that I still haven't upgraded >_>) and Fx 25 on XP. >108 brightcopy: It's not the end of the world. I'm a spoiler hog anyway. I actively search them out! At least now I can tell that there is supposed to be a spoiler there. I get the same thing here on my desk computer that I do on the iPad. Spoiler (click to see)This is a test. For what it's worth, it won't let me copy the Spoiler (click to see) part. Interesting. Updating Firefox also has not fixed my issue with not seeing the whole cover when I click on information. I can see the whole cover on the iPad if I hold it portrait. IE8 seems to be working well now. I welcome feedback on that. I just did a few changes and spoilers are working for me on my iPad using iOS7. Can you check yours? IE8 is working for me now. Thanks! And no comment at all on my suggestion for disabling compatibility mode in IE for LT? AGAIN? Looks just the same as ever on the iPad. I probably won't be firing up the other today. And you're using iOS7 on your iPad? And you certainly can't know the inner decision-making reasons as to why we do or don't do some things because, well, I don't even know some of those reasons some of the time. heh. You use the magic eightball, right? 116> yes. 7.0.4 It says I am up to date. I'm (also on) iOS 7.0.4 (iPad 3/iPhone 5), and using Safari I see the spoiler tags as intended. #121 by MarthaJeanne> Silly thing to ask, but can you try creating a new LT account and see if you see the problem on it as well? From my previous experience, I'm wondering if something is getting stuck tied to your account. 123>You're right. It works here. But I'm going back to my personal account. I can't stand these colours. #124 by FiberArtsGroup> I can't stand these colours. Could this be because your MarthaJeanne account is set to revert to the OLD LT design? Tim or conceptDawg? I'd try testing it, but I can no longer find where you could change that. It used to be on the right-side news column on the Home page but it slid off and there's no way to get older news items I can find. >125 brightcopy: But then why would it work on Chrome but not Firefox? I can't say for sure, because I can't remember if it's a per-account setting or a per-browser one. If she used both the iPad and FF desktop regularly, she probably reverted the design on both? Do you know if you reverted the design? I might have. I don't remember if I reverted or never changed over. #128 by Morphidae> Well, if you did nothing, you got the new design. If you specifically clicked to revert it, you got the old one. There may be other things that can do it, but this is definitely one. BTW, this is why when lot's of people asked "but why can't you just keep the old design for people who want it and the new one, too" the LT devs replied "because that would increase our development time to support both sites." This is one of those examples. Got it. Well, like I said. It's not the end of the world for me. I'd much rather have the old version than have the spoilers tag work! I hear ya. Different strokes and all. So, does that clear up all the examples of people having problems, between the IE compatibility mode (fixed now) and people who are still on the old design (up to LT devs to decide if it's worth spending the time on)? Anyone else having problems with spoilers who does not fit in those categories? 131> Yes! Those strong colours just fry my eyeballs. BTW I think it's by account. They don't fry my eyeballs. I just think they are ugly as hell. I know I'll eventually be forced to deal with it and I'm dreading it more than you can imagine. I've actually thought about quitting when it happens (not that I would) but that's how much I absolutely hate it. I'll deal with the question of quitting or not when the time comes, but I won't 'hang out' here doing combining and such. At most catalogue and get off line again fast. The thing is, I do "hang out" for hours in Talk. So it's not like I can get on then off. It would be a decent chunk of my day looking at something I think is ugly. But anyway, this is entirely off-topic. Sorry for the derailing! I'm on the old version, but I'd like to switch over to the new one to get my spoiler tags working. How do I do this? Well, I posted a bug about not being able to switch. But it appears LT staff have been preoccupied with something else. I think you should put a profile message on lorannen's and/or matthewmason's profile. >137 pwaites: Fixed! Think you should be all set. It should at least be there to switch to the NEW design for anyone still on the old one. Otherwise, how do you expect anyone who's not a Talk user to ever figure it out (or even remember the new design exists)? Yeah, I can understand not leaving the option to switch back to old, that's rather natural, but not providing a way to switch to new? What in the world is the point of that?? I've decided I don't like this feature. It makes me stumble. And when there's more than one within a single post (or consecutive posts), the clicking--pick up again on the thread of the thought--lose it again--click--REPEAT gets annoying fast. I find I increasingly tend to just skip any post peppered with spoilers. Something new and cool can get overused at first. 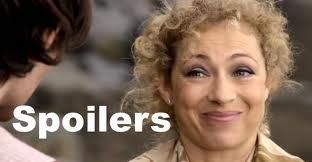 Just wait 'til things settle down and Spoilers Feature becomes part of the landscape. I predict you will see less peppering. Great news! Thank you for implementing this new spoiler feature! Though this is probably too much work to ever get fixed, I think it's worth noting that the spoiler tag does not work when posting reviews to Facebook. So be careful if there's a spoiler you want to hide in the first few lines of your review. >147 norabelle414: It won't work for any other site, it's strictly LT-related. Sure, but if you have set it up so that your reviews are automatically shared on Facebook, as many have, this is important to be reminded of. But why on earth would anyone expect that LT-specific features would work on another site? It would be like complaining that Touchstones don't work when sharing reviews on Facebook - at some point you have to assume people have a basic notion of how the internet operates. I wouldn't think that it would be a lot of code to add a prompt that said something like, "This review contains spoiler text that will be shown on Facebook. Are you sure you want to post it?" Perhaps it could even give the option of stripping the spoiler text out. >151 jjwilson61: Yeah, or adding in a plain text spoiler warning where the tag would have been. Yeah, I think norabelle414 has a good point. I don't think she expects it to work, I think she just brings up the point that you have to keep it in mind. And I think jjwilson61's idea about having an option to have it strip out the spoiler (maybe replace it with "spoiler hidden" or something) is great. I know if I had a facebook friend who posted LT reviews, I'd appreciate not having spoilers popping up in my news feed. I was aware that it would not work correctly in Facebook, but did not know what, exactly, would happen. Have you or anyone else seen the result? Would be good to know that it doesn't do something silly like send mangled/escaped html to facebook, making the review look goofy. That's apart from the idea of a feature that marks it as a spoiler warning like jjwilson61 suggested. Out of curiosity, what happens to standard HTML in reviews that publish to Facebook? >155 brightcopy: It posted the text as if it did not have the spoiler tags. My personal solution was to (after deleting the spoilerific post) replace the spoiler with the word "SPOILER", post the review to Facebook, and then edit my review to have the spoiler tags, without posting again to Facebook. That way people who see my review on Facebook do not get spoiled, but if they click through to LT they have the option of clicking to see the spoiler. Thank you! I love the idea of the spoiler tags, and I hope people use them to at least hide big plot twists and answers to mysteries in reviews. I am someone who likes to read a few reviews to see if a book is worth reading, and it's annoying to find out it is, but someone ungraciously spoiled the 'big reveal'. I don't find it ungracious at all. My review is primarily for me and since I've read it no spoilers result. Part of a thorough review, for me, is a discussion or treatment of any and all parts of the book; a big reveal included. I don't just want plot regurgitations. That said I also warn in my reviews for those who are sensitive. To some degree I am and just watch myself when reading reviews of unread books. I skim and sense the tone of things before I get to deep. But ungracious? The though never occurred to me since those reviews also belong to their writers. The implication in that post is that the spoiler was given without any sort of warning. It's not ungracious to reveal the ending as long as you give people a heads-up first, via a "SPOILER WARNING" text or with this new spoiler tag. Otherwise, I think it's being a bit obtuse to not recognize that reviews are made for public consumption. There is already a private comments field if you wanted to just have a "for my eyes only" comments on a book. The entire function of the review box on LT is to stick it out there in public. The "private comments" field is not a review field. Some people, it may surprise you to know, actually use it for comments, not reviews. The entire function of the review box on LT is to stick it out there in public. That's simply not true. That may be one function of it, and, if I recall correctly, it's not one that has always existed. Reviews, as has been pointed out, are often done for the reviewer's personal purposes. Sorry, can't really agree with you on it. It's like if people argued that they were posting to the monthly reading thread only for their own purposes and that it wasn't primarily a public post. That's just not how LT reviews work. Okay, so we are back to arguing about the function of the review box? Seriously? Might as well leave the reviews that read "$5.99 shipped" as a review if we are going back to this argument. Otherwise, I think it's being a bit obtuse to not recognize that reviews are made for public consumption. I wouldn't say that (I once would have, but enough people over the years have said "My reviews are for ME ME ME" that I no longer would) but I do think it's a bit naive to not realize that other people may read your reviews. I often do not read LT reviews, since some reviewers confuse "synopsis" with "review." I find ratings useful, but not in the context you'd think. If someone rates a book high (or low), and we have books in common, I see how they've rated those books, which gives me a benchmark in whether or not their ratings are useful *for* *me*. I've probably written reviews for the majority of books I've added, and try to make them informative and honest. There are times when a review (here, or on Amazon, or elsewhere) has been very helpful, when I've been trying to decide whether to purchase a book or not. Reviews are public; that's why we call them *REVIEWS* rather than "private notes" or "commentary." I would postulate that the root of the word "re-view" merely suggests secondary thoughts on a previous reading, regardless of whether it is done publicly or privately. If it was mandatory for a review to be public, the word used would be more along the lines of "declamation" or "pronouncement". Unless, of course, i am completely mistaken in the etymology of the word, and "review" actually comes from "rev", to accelerate, and "iew" to make a exclamation of disgust. Or "r", to speak like a pirate, and "eview", to read a book electronically. Let's see. Last night I viewed that movie, and I liked it so much I want to re-view it tonight. Sorry. It was just too much temptation for me.